A durable power of attorney for health care, also referred to as a healthcare proxy, is a document in which you name another person to serve as your health care agent. This person is authorized to speak on your behalf in order to consent to – or refuse – medical treatment if your doctor determines that you are unable to make those decisions for yourself. A durable power of attorney for health care can be operative at any time you designate, not just when your condition is terminal. For maximum protection, it is strongly recommended that you have both a living will and a durable power of attorney for health care. The power of attorney affords you flexibility, with an agent who can express your wishes and respond accordingly to any changes in your medical condition. Your agent should base his or her decisions on any written wishes you have provided, as well as familiarity with you. 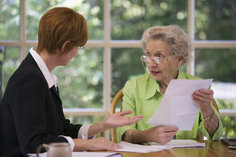 The advance directive is necessary to guide health care providers in the event your agent is unavailable. If your agent’s decisions are ever challenged, the advance directive can also serve as evidence that your agent is acting in good faith and in accordance with your wishes.